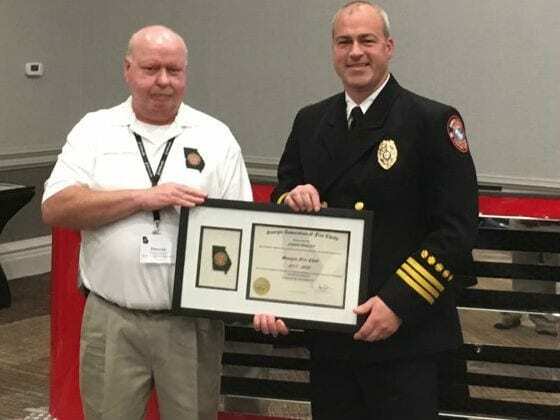 Dawsonville, Ga. — Dawson County Emergency Services (DCES) Batallion Chief Jason Dooley is one of only 14 chiefs to receive Georgia Association of Fire Chiefs (GAFC) certification during the recent Spring Executive Training Session in Savannah. The program is divided into three categories of certifications: Georgia Volunteer Fire Chief Certification, Georgia Chief Fire Officer Certification and the Georgia Fire Chief Certification. Dooley was awarded the Georgia Fire Chief Certification. The 14 chiefs who received new certification join 79 others who already hold certification. “We have developed this program to ensure that fire departments in the state of Georgia have qualified, credentialed and professional leaders and managers overseeing their departments and personnel,” said GAFC President Dwayne Jamison. Certification applicants self-apply and must meet several pre-requisites to qualify, including serving as a battalion chief or division supervisor. A points system reflective of their years of service, higher education achievements, level of fire officer designations, recognition of additional credentials and the completion of the Chief Fire Officer classes are all used to assess the applicants. Dooley has been employed with DCES since 2007 and currently is assigned to C Shift.